TSA officials would not provide specific employee totals, citing security concerns. But “the number of people calling out because of financial concerns is increasing,” said Michael Bilello, TSA’s assistant administrator for public affairs. “And people will have to make a decision: ‘Can I afford to go to work today?’ ” Bilello added. Numbers from the agency, covering Tuesday, show 6.1 percent of employees did not come to work. That’s nearly 1 out of every 16 workers, and a 65 percent jump in call-outs from the year before. TSA said the call-outs have forced three major airports — Atlanta, Houston and Miami — to operate under contingency plans meant to address various disruptions. In this case, the disruption is the partial shutdown over President Trump’s push for billions of dollars to build a border wall. Nationwide, the Transportation Security Administration screened 1.79 million passengers yesterday (Wednesday, Jan. 16). Overall, 99.9 percent of passengers waited less than 30 minutes and 95.4 percent of passengers waited less than 15 minutes. Use the MyTSA app for 24/7 access to airport security information on any mobile device. In TSA Pre✓® lanes, passengers on average waited less than 10 minutes. Please refer to the table below for top airport specific wait times. While national average wait times are within normal TSA times of 30 minutes for standard lanes and 10 minutes for TSA Pre✓®, some airports experienced longer than usual wait times. 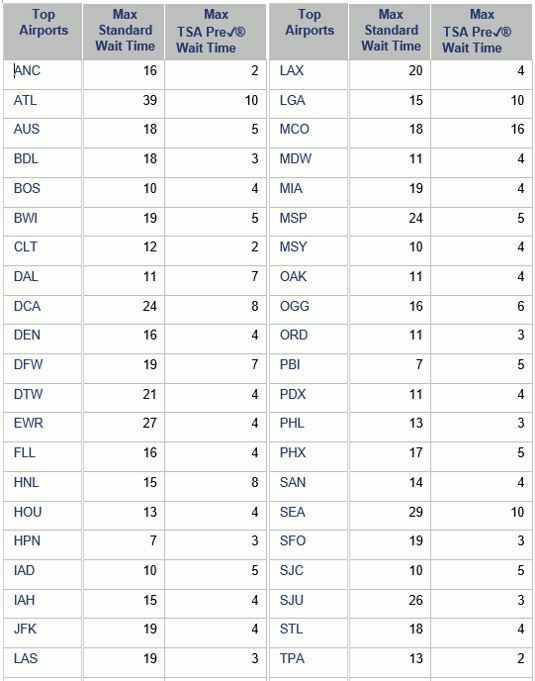 Below are yesterday’s maximum wait times experienced by passengers in standard and TSA Pre✓® lanes at the top 42 U.S. airports. The MyTSA app provides passengers with 24/7 access to airport security information on any mobile device. Find out which items you can bring with you through the checkpoint, see weather conditions at your favorite airports, request live assistance from AskTSA, and much more!